Offer peace and comforting prayers during times of loss with this elegant blue and white basket arrangement. A gathering of fresh roses, delphinium, alstroemeria and carnations, beautifully hand-designed by our florists. 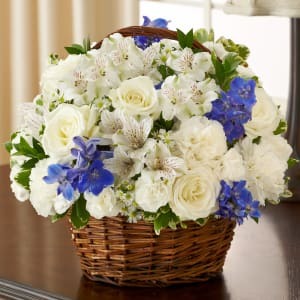 • Graceful blue and white arrangement of roses, delphinium, alstroemeria, carnations, mini carnations and monte casino, accented with variegated pittosporum and myrtle. 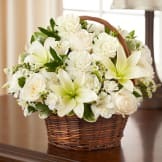 • Hand-arranged in a willow handled basket measures 8"H.
In my procrastination, I ordered this arrangement late the night prior to the service. They arrived prior to the service at 10 am the next morning. Arrangement was beautiful and was a favorite of the deceased's mother...she loved the doves! Thanks so much for getting such a beautiful arrangement to the service so quickly! I found it amazing that I could place the order from Europe. And the delivered flowers were beautiful. It was very nice. And it made it very convenient. Thanks. Thank you, the flowers were lovely and were true to the photo shown. They were delivered on time and to the correct location. Thank you.